Throughout your commission as an active Notary Public, you may be asked to perform a range of notarial acts. One common request is for copies to be created of an already certified document. State permitting, you will need to show a certain amount of information on each individual certified copy you make. 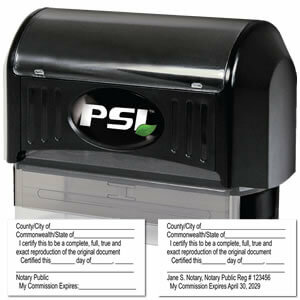 With our PSI Pre-Inked Certified Copy Stamp, your job as a Notary Public just got easier. With a simple press to a page, you will have all of the required information printed on the page - all you will need to do is fill in the blanks with the personalized information. It is important to check with your state board about the types of documents you can legally make certified copies of. In most cases, your state board will allow you to make certified copies of many things but will require you to have a specific information on the copies. TPSI Pre-Inked Certified Copy Stamp gives you ample room to fill in the necessary personalized information about each certified copy. A clear base on the bottom of this durable, eco-friendly stamp will assure a proper placement and impression every time.